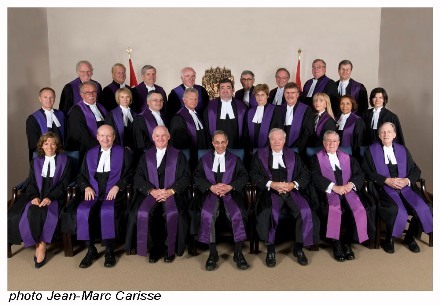 The Tax Court of Canada Bench. Photo Credit: Tax Court of Canada. 1. Electronic Filing - you can file pretty much any document that needs to be filed with the Tax Court by simply uploading it to the court's website, which is a still very rare practice in Canada. The Court even lets you file now, and pay later - you can mail in the filing fee within 5 days of filing the documents electronically. 2. Hearings and Registry Offices in Convenient Places - you can ask the Tax Court to hold a hearing almost anywhere in Canada, and it will regularly hold hearings in places as small as Wabush, Yarmouth and Percé. Plus there are registry offices for the court in every province and territory. By comparison, for many courts you're required to travel to the court, the court won't travel to you. 3. Easy to Get Hold of and Knowledgeable Registry Officers - wondering about an answer to the rules of court? Just pick up the phone, and helpful registry officers who are easy to get through to will answer all your questions. 4. Simplified Rules of Procedures - the Tax Court still has rules of procedure, no court can operate without them, but for the Tax Court the rules are a lot simpler than the ones you will find in other courts. It seems like someone carefully went through the rules of other courts when putting together the tax court rules, and threw out everything that seemed overly technical, and which would not particularly enhance litigation economy. 5. An Expert Bench - in many courts judges are supposed to be experts in a host of areas of law, but the reality is that it isn't possible to be an expert at everything. But with the Tax Court, the judges really can become experts because the court's jurisdiction is narrow enough: the Income Tax Act, Employment Insurance Act, GST/HST, CPP, Old Age Security, and a few other Acts. Now that you're all excited about going to Tax Court, there are a few things you need to take account of before filing your appeal: (a) you will usually need to file and receive an answer to an internal objection first from an appeals or review officer within the government department that denied your claim prior to appealing to Tax Court; (b) if the taxpayer is a corporation, it must be represented by legal counsel, and (c) if your appeal is complicated, it's a great idea to be represented by a lawyer. At least in tax appeals it's often clearer than in some other types of cases as to whether hiring a lawyer is worth it, based on a comparison of the amount of tax in dispute compared to the likely legal fees to be incurred.